I have multiple chinese micrometers I buy in bulk (and sometimes sell). The really good ones I use are excellent, in digital mics, dtis, and calipers. A 1-2" digital mic is about 1 micron accurate and 1 micron consistent. And costs about 70€ retail with 22% VAT tax included in EU land. I tested blind with gage pins and micrometer standards. 20 test measurements on different gage pins, one was 2 microns off, about half were zero error, about half were 1 micron error. I also tested 4 different cheap digital 1 micron micrometers. Repeatability was 3-5 microns and varied up and down, sometimes randomly, and measurements would bias on any fast closing. So the frames/mounts/faces bend and screws are inconsistent. I should do a web page/video of the tests with pics, showing the errors. My mics and calipers and DTIs are made by Shaahe china, but I will sticker private-label them for retail sales. Since I will fix issues myself, I prefer to directly stand behind them. I only make 20-30€ each, so anyone can order direct if they want. My data shows the tested results being as good as specs for 600€ midrange tools from Fowler, Starret, Mitutoyo, Federal, etc. For about 75€ small mics and == 100€ to 6". I have had about 3 years use on 10 tools, and have maybe 30 assorted new in boxes. Batteries are 2032 lion button cells, last about 1-2 years. SPC data cables are cheap, vs name brand japanese stuff. Lots of chinese stuff is excellent, bang/buck. AC brushless servos are one other excellent product line, apart from the measuring instruments. 100mA usable capacity out of CR1632 would give about 50 000 hour/6 year battery life. Me happy. What's the usable capacity of the LR44 battery? SR44 silver oxide 190mAh to 1.2v cut-off voltage. I recommend this over LR44 even if its bit more expensive to buy and maybe a bit harder to find. I didn't realize there was such a large difference between the LR and SR. I always try to use the SR44 because I thought their voltage was more stable. 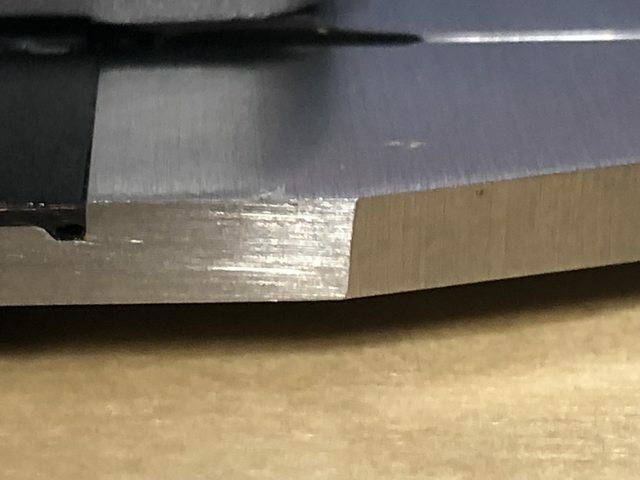 Forgot to mention that non-functional surfaces are not what you would see on a Mitutoyo, sort of "hand crafted look" IE deburring radiuses look bit random, deburring marks here and there, and some of the body dimensions look to be coming right out of freehand belt grinder. I'm wondering about the brand name on those as the finish on those I get are as good as Mitutoyo. Gordon: still talking about Pride -brand bought from their own webshop in aliexpress. Functionally close to Mitutoyo but non-critical surfaces are grind bit crooked, edges not 90-degree angles and deburred bit funky. Maybe I’ll take some photos to entertain you. -Outside jaws are deburred&rounded to kind of random shape. One of them is deburred on the outside and another not at all. Fixed jaw is deburred&deformed on the measuring surfaces more than moving jaw. -grind lines are not intersecting at 90 degree angle so something is non-perpendicular. Turns out that the end of the caliper what you would use for measuring step height is grind at 91 degrees. And maybe weirdest of all? outside jaws are not perpendicular to slide rail. About 0,11mm out of square over a 75mm distance. "Maybe I’ll take some photos to entertain you." Strange choice of words. After reading what you've just written I looked again at the 5 I had received from Pride. They look and feel good to me so maybe you are right and I got hand picked. So far everything I've measured with them (externally and internally) is correct to within 0.005mm (0.0002"). I also got 0-25mm and 25-50mm digital micrometers plus Go and NoGo plug and ring thread gauges (M8) for virtually nothing and everything was satisfactory. I guess time will tell. 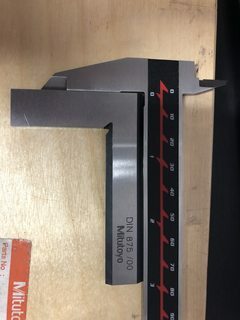 My main interest in digital calipers is using them in connection with thread measurement and that means mounting attachments. Other types of measuring equipment in general is only if I get a specific request from a customer. Now that brand names have been mentioned then Anyi is my favourite (not cheap but not expensive either) and I've always been more than happy with what I've bought from them. I'm (with wife and friends) in the bottom 2 pictures during a visit to them in Guilin, China. I knew the owner (Fengshan Wu and not in the pictures) personally before I ever visited. After reading what you've just written I looked again at the 5 I had received from Pride. They look and feel good to me so maybe you are right and I got hand picked. So far everything I've measured with them (externally and internally) is correct to within 0.005mm (0.0002"). For the price Im satisfied enough with the ones I got as it looks like they should have outstanding battery life and they dont seem to mind cold weather. And they work smoothly. What I found most interesting (but largely irrelevant for actual use) is the non-perpendicular jaws to the slide. I mean are they matched pair? grind somehow as assembly? or is all of their production off by that much? I did as you did and checked with a square. It does look as if they are not exactly 90º. I simply can't imagine them being ground to match after assembly so either their manufacturing is slightly off (most likely) or it's an optical illusion. No matter where I measure in the jaw length the result is the same to within 0.005mm / 0.0002" and that is the important thing. What did impress me most was how accurately they measured small holes. That's usually the weak point of any caliper. 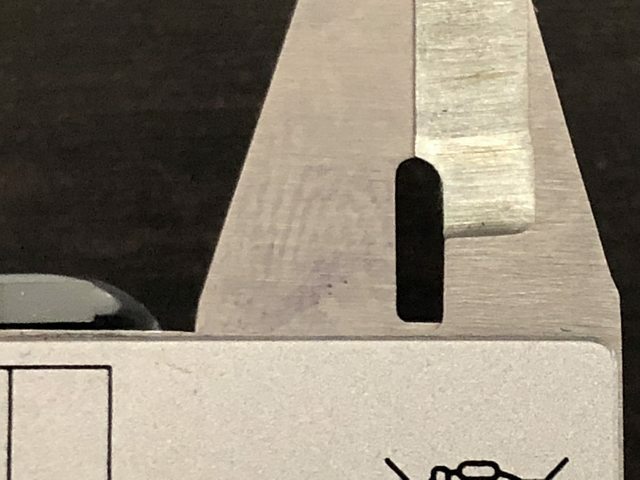 Here's a test for anyone with an older Mitutoyo digital caliper. Switch on and push down on the very left of housing from above. The result of course shouldn't change but if it does you have a problem. If anyone tries this and experiences a "jump" of more than 0.02mm / 0.001" I'll give more details. If not then "no problem". To contribute my own experience with Chinese precision tools, I once bought a really low-priced 4 inch SPI ("Swiss Precision Instruments") dial caliper for use at my desk. It literally came apart within two weeks and had to be thrown away. Within the last few years we had to buy both 24 and 40-inch long-jaw electronic calipers to replace our former tape-measure-over-clamped-on-parallels method of checking long dimensions during assembly. I had previously owned several Fowler brand electronic calipers in the 6-inch size with Sylvac electronics and they were quite accurate, so that was the one Chinese-made measuring tool I allowed in the shop. I recommended them to new employees who wanted their own calipers for quick monitoring of their parts, as they cost a lot less than Mits and felt better than Starretts. At last look, however, item for item, the Fowler brand was no longer cheaper. I imagine popularity drove the price increase. These came from MSC. 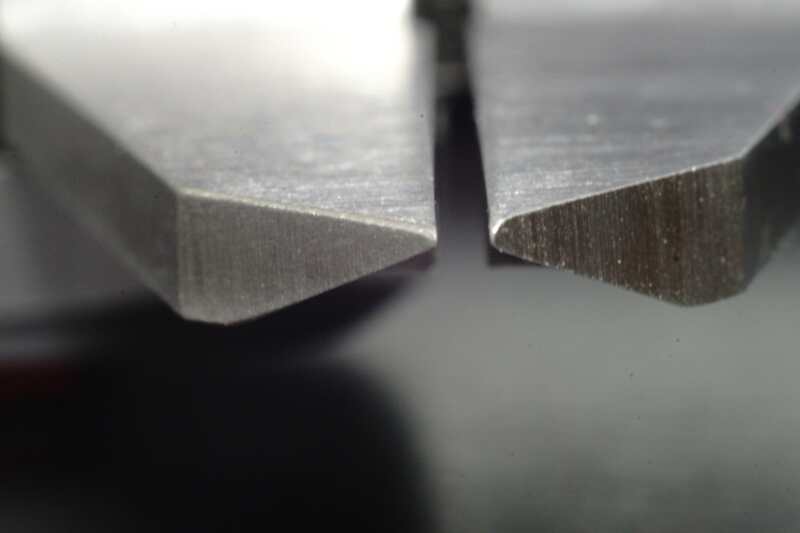 I have no problem with them, they are hardened stainless and are square and repeatable (provided you use the right technique for handling long jaws and a long heavy beam). Who knows what Chinese factory made them for the Fowler brand, but if they marketed them themselves I would be a customer. Just for giggles I sent a claim for faulty product, take it as a sort of test to see if they see any problem with the jaws finish or not. Next on review pipeline are Hanermo's recommendation over "Shahe" brand calipers. I recently bought a set of the 0-12" .0002 Microtech calipers referenced in the beginning of this thread. Regarding the "made in ukraine" stamp, I did notice that the plastic case looks a lot like my chinese Anyi .0002 0-8" case... Anyway I really like the microtech calipers. They have a force gage built in for outside measurements. Silky smooth and test out spot on with my micrometer standards up to 8". Nice raised buttons esp for zero reset. ID to OD is good as well. Plus theyre yellow, easy to find. I like them enough that I just bought the 0-6" .0002 model. I ordered the Anyi a year ago direct from Anyi as my favorite Starret 799a quit working in high humidity. Also very nice, smooth and accurate. Only downside is no thumbwheel. I have many other Mitutoyo, Sylvac etc but Ive been using the Anyi and now the microtech as the new favorites for the quick measurement stuff. There has been at least one thread on SPI, and "Swiss" may have been part of the name at some point, but today it is MSC's "house brand" and not exactly Western European FOB. I hate their controls, and my Brown and Sharpe 30mm mic has the same head on it. I love the mic, but absolutely hate having to ZERO the bloody thang! I end up pushing buttons until at some point I end up with it where I want it. Kind'a like throwing Shiite at the wall... eventually something will stick eh? The Anyi caliper in the last picture is excellent but no longer available at the moment. Really? You are OK with "precision" and "really low priced" in the same sentence? That was my comment. Nothing more, nothing less. And the next caliper under scrutinization is from Shahe. -crappy battery life, 20uA ON and 20uA when powered OFF, no difference at all if you turn the caliper off or not. Works out to about 10k hours or about 1 year battery life. Definite disappointment. -Feel and sound is more gritty than the "Pride" caliper, movement binds pretty badly if adjusted for nice&snug fit at small end of measurement range. -pretty annoying battery compartment design, shoots the battery out half of the time before you manage to put on the lid. +-Accuracy appearst to be within +-0,02 mm specification but just barely so. -- P.S. This caliper seem to have standard mini-USB port for computer connection but the port is anything but USB. As typical for chinese they use whatever connector seem fit and you need to buy Shahe's speciality usb cable with "black box" to connect to computer. I tried it with normal usb cable to computer and got "Power Surge on USB Port" warning on computer screen. Maybe the serial port connection on caliper got fried also.